Fayette’s Trista Fruchey lays one in during a BBC contest against Montpelier this season. The sophomore was recently named first team All-BBC. 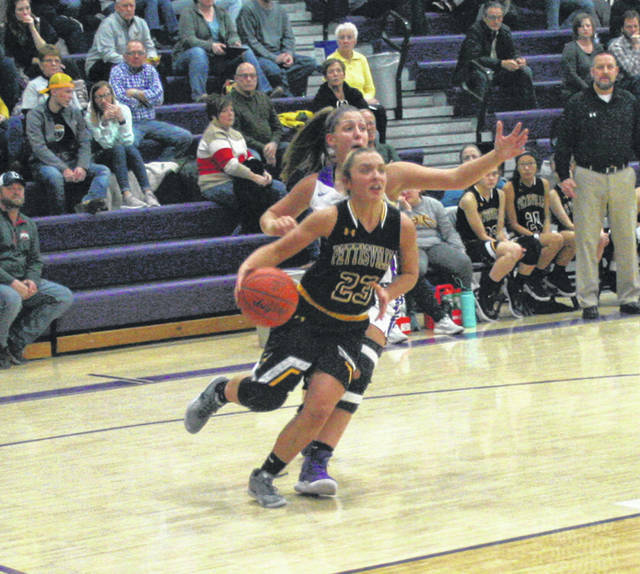 Brandi Schnitkey of Pettisville drives around a defender in a game at Swanton this season. She made second team all-league for the Blackbirds. 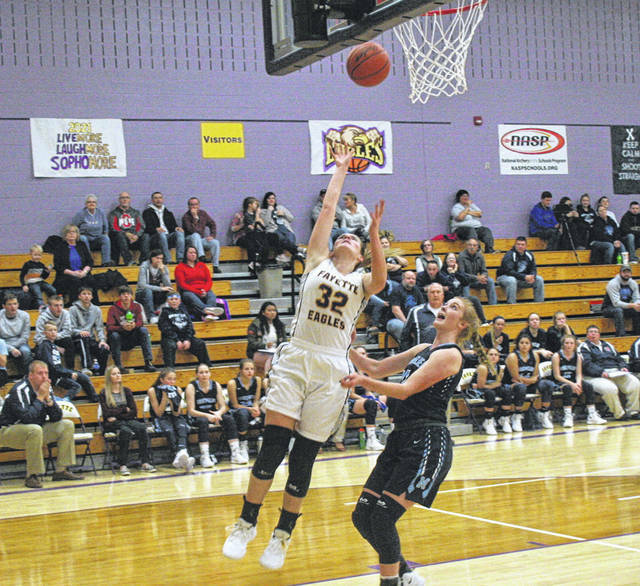 Pettisville’s Morgan Leppelmeier was named the player of the year in the Buckeye Border Conference’s all-league girls basketball list that was recently announced. It was the second year in a row she received that honor. On the second team for the Blackbirds was Brandi Schnitkey. Elizabeth Beck and Mikayla Graber were honorable mention All-BBC. Trista Fruchey of Fayette was selected first team All-BBC. Honorable mention all-league for the Eagles were Mataya Rufenacht and Rhys Ruger. Jaelyn Lyons, sr., Montpelier; Emma Grime, sr., Stryker; Brittney Haines, sr., Stryker; Claire Radabaugh, jr., Edon; Trista Fruchey, soph., Fayette. Madison Brown, fr., North Central; Sidney McKarns, sr., North Central; Brandi Schnitkey, sr., Pettisville; Courtney Stewart, jr., Stryker; Arianna Howard, jr., Edon. Fayette: Mataya Rufenacht, Rhys Ruger. Pettisville: Elizabeth Beck, Mikayla Graber.